You are here: Home / Climate / Corals "adapting to climate change better than previously thought"
Corals "adapting to climate change better than previously thought"
From The Science is Settled department. The death of the Great Barrier Reef from the evils of man-made global warming is one of the greatest scaremongering arguments of climate alarmists, despite the fact that pollution and run-off from agriculture are far more damaging. The notion that organisms that have been around for millions of years are unable to adapt to the gentle warming of the late 20th century has always struck me as patently nonsensical. Hypersensitivity to small changes in climate would ensure that most life forms would fail to survive the billions of turbulent years on this planet to be still here today. Clearly this isn’t what we observe. On a similar note, an earlier post examined how tropical fish can adapt to dramatic temperature changes in just two generations. This assumption of fragility is yet another example of our failure to appreciate the robustness of the ecosystem. CORAL reefs may be much better able to adapt to rising sea temperatures due to climate change than previously thought, according to a breakthrough Australian discovery revealed yesterday. The research undertaken at the Australian Institute of Marine Science (AIMS) and published in the journal Nature Climate Change has overturned previously held assumptions about coral bleaching and which corals may survive in warmer waters. According to PhD student Emily Howells, the findings demonstrate the potential for corals to adapt is more widespread than previously thought. Further research is under way to establish the speed at which coral can adapt to rising water temperatures, and whether it will be fast enough to survive the impact of climate change. « Climate scepticism akin to creationism? Darn….now they’ll have to invent another crisis to take the place of that! She is going to wake up with a horses head in her bed and a brick through her window with a note on it. Lin Anderson, whatever happens they use it as “evidence” for their shameful ridiculous claims. If we have a cold snap …it’s Global Yawning, if a warm period …it’s Global Yawning, whatever happens … for them, it’s Global Yawning!! Hahaha. Of course it does…that was the first thing I looked at!! Bubbling CO2 into an aquarium, fresh or salt (calcium reactor), increases the growth in the tank. Just like it increases growth in a greenhouse. More CO2 also means more O2 for fish and invertebrates. The tide is turning. “Recent experiments conducted at the Australian Institute of Marine Science (AIMS) produced striking results, showing for the first time that corals hosting a single type of “zooxanthellae” can have different levels of thermal tolerance – a feature that was only known previously for corals with a mix of zooxanthellae. Zooxanthellae are algal cells that live within the tissue of living coral and provide the coral host with energy; the relationship is crucial for the coral’s survival. Rising ocean temperatures can lead to the loss of zooxanthellae from the coral host, as a consequence the coral loses its tissue colour and its primary source of energy, a process known as ‘coral bleaching’. Globally, coral bleaching has led to significant loss of coral, and with rising ocean temperatures, poses a major threat to coral reefs…. 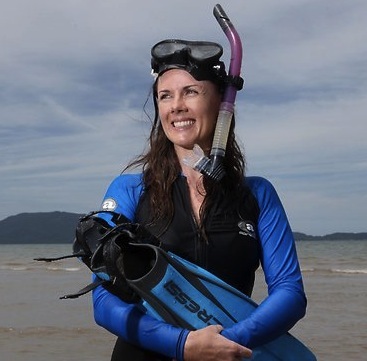 “However, we do not yet know how fast zooxanthellae can adapt, highlighting an important area of future research”, says Bette Willis, Professor from the CoECRS at James Cook University. Putting paid to the assumption that “Given the sea surface temperatures around the GBR are pretty flat”. HMMM! Be sure to let us know when you want us to take you seriously Sillyfilly. Can you link me to Mclean graph at that site or can you refer me to the technique he used to produce his graph from the NOAA datasets. That’ll ease my scepticism of his analysis. Do you feel like a silly fish? Looks to me as if the long-term temperature data is pretty even. We’re often told that the sea temperature along the Great Barrier Reef (GBR) is increasing and that soon the coral will be bleached and the reef be destroyed. But what’s the real story according to the data? The sea surface temperature (SST) clearly fluctuates throughout the year by about 5 degrees, typically with highest temperatures in January and lowest temperatures in August. It is also clear that The SST rises with the onset of El Nino events and falls with the onset of La Nina events.